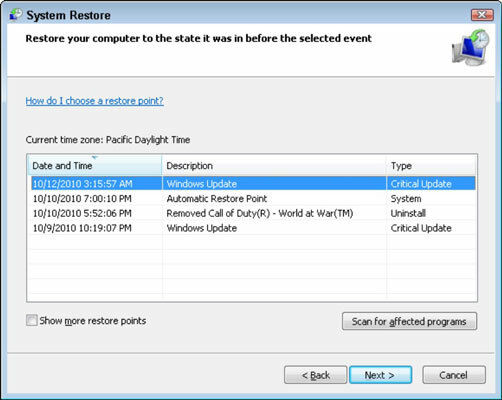 When you do a system restore, Windows 7 and Windows Vista choose the most recent system restore date and time. Sometimes, you may want a less recent restore point. For example, when a system upgrade and a software addition are botched, you need to restore your computer to a point from several days earlier. To restore to an earlier point, follow these steps. System Restore operation restarts the computer. Save your files then close your programs. Do it now. From the Start button menu, choose All Programs→Accessories→System Tools→System Restore. In Windows Vista, click the Continue button or type the administrator’s password. System Restore’s main window appears. That is, unless you’ve recently restored the system, in which case you see an option to undo the System Restore. A list of recent restore points appears. The most recent restore point is selected, which is most likely the one you want. If you don’t see recent restore points and instead see another screen, choose the Recommended Restore option. Choose the proper restore date. To restore to an earlier time, place a check mark in the square by the option Show Restore Points Older than 5 Days. A screen detailing which hard drives to restore is shown. The one you need is most likely already selected. Click Yes to restart Windows. After you log in again, you need to wait a bit more. Eventually, you see a confirmation message explaining that Windows has been restored: You see (after a seemingly endless amount of time) a dialog box explaining how the System Restore operation went; click the Close button. Restoring the system is also a start-up option. Choose the option Last Known Good Configuration, which is more or less the last system restore point. You can also perform System Restore in Safe mode. That’s a good choice, especially when the computer is unusable otherwise. Choosing an older restore point increases the likelihood that the restore won’t be successful. If possible, you can try to incrementally restore by choosing a more recent restore point and then running System Restore again with an increasingly older restore point. When you restore to an older restore point, you remove any software and hardware updates installed in the “between time,” where some programs and certain hardware don’t work and require reinstallation after the System Restore operation is complete.